Three times in a row, he mutters to himself. "I just can't believe it. I just can't believe it. I just can't believe it." So when I heard she came out with a book last year, Thinking in Bets, I did like any other personal finance blogger would: I put in a request for the only copy at the library and patiently waited a few months until it became available. It's easily one of my favorite books of the past year. And as I tend to do, I found myself relating its key messages back to financial independence and early retirement. One of the ongoing debates that I find myself having in personal finance twitter centers on the idea of meritocracy. That whatever situation people find themselves in, it's more or less the result of their effort and skill. If someone is wealthy, it's because they had some skill that was rare or simply out-hustled other people. If someone is poor, it's because they didn't study in school or weren't willing to put in the effort. As it relates to financial independence, the meritocracy argument states that the math is the math: the shockingly simple math of early retirement is the same for everyone. Sure, some people are in high cost of living areas and some other people might have lower incomes, but the math works for anyone who wants to try. We can all reach financial independence; the only reason there are so few who do is that the idea of FIRE is new, or that most people won't give up their new cars or dinners out. Of course, an argument for pure meritocracy is pure nonsense. And readers of this blog already know that I posit that financial independence and early retirement are clearly not possible for everyone. But Duke presents some of the problems with the meritocracy worldview in a far better way than I could. In poker terms, the meritocracy argument is an example of resulting: of judging the quality of our decisions based on the results of those decisions. If you get a good result, you made a good decision. If you get a bad result, you made a bad decision. Except that life doesn't work out that way. Individuals can make decisions that give them the best chance of success (e.g. - investing a lump sum all at once beats dollar cost averaging 60% of the time when CAPE is north of 32), but still get a bad result. (In fact, in this example this bad result will happen to four out of every ten people.) If you're one of those unlucky people in the 40%, does that bad result mean you made a bad decision? Similarly, individuals can make poor decisions that end up having good results. Say a future personal finance blogger who will write about leaving the workforce by forty decides to drop out of college at the ripe old age of nineteen, despite having a scholarship, to follow a girl across the country to San Diego, with no money and no idea whatsoever on how or if he will finish college. It ended up working out just fine for him. Does that good result necessarily have much to do with the quality of his decision? This is resulting in action, and one of the main flaws with the worldview of meritocracy. People who end up with good results didn't necessarily achieve them due to making good decisions. People who suffer bad results might have gotten that outcome because of bad decisions, or they might not have. The quality of our decisions play a factor, and luck plays a factor. Always. The problem is that we humans, we predictably irrational humans, often will make 'fielding errors' when deciding whether our (or someone else's) outcomes are the result of luck, or the result of the decisions we make. "When we have a good outcome, it cues the routine of crediting the result to our awesome decision-making, delivering the reward of a positive update to our self-narrative. A bad outcome cues the routine of off-loading responsibility for the result, delivering the reward of avoiding a negative self-narrative update. With the same cues, we flip the routine for the outcomes of peers but the reward is the same -- feeling good about ourselves." And indeed, the binary view of luck and skill is itself, a bit of a lie. "Once we start actively training ourselves in testing alternative hypotheses and perspective taking, it becomes clear that outcomes are rarely 100% luck or 100% skill. This means that when new information comes in, we have options beyond unquestioned confirmation or reversal. We can modify our beliefs along a spectrum because we know it is a spectrum, not a choice between opposites without middle ground." Duke notes that many people think that if life were a game, it would be something like chess. There is no luck in chess. The outcome of the game is completely the result of your skill and your decisions. If you lost, it is because you made inferior moves or a poor decision. And because there is no hidden information in chess, no advantages for one player or another other than who is white and goes first (metaphor intended! ), the outcomes are completely fair. If you won the game, you deserved it. If you lost, you deserved it, too. Duke posits that life is not actually much like chess, with its perfect information and lack of luck, but more like poker. In a game of Texas Hold'em, you'll start with different cards than your opponent: often cards that are much, much worse than those of whomever you're playing. And unlike chess, players have to make decisions without all the facts. You have to place bets without knowing if you're ahead in the hand or not: whether the odds are in favor of you putting money at risk or waiting for another time. Skill is undeniably important in poker, as any amateur who's sat down at a card room at a casino can attest. But it's not the only factor. A professional can play a hand perfectly, force their opponent to go all-in with the worst hand, and still lose when one of the two cards their opponent needed comes up on the river. You can play it right, and still lose. Similarly, you can play a hand terribly, and still win. Skill and luck are always at play. I think this metaphor of poker much more accurately describes the environment that we make our financial decisions in, rather than thinking of modern life as chess. When we see that someone retired in their thirties, do we stop to ask what cards they were dealt? We certainly get lots of blog posts and articles about the way they played their hand. What were their tactics and strategies? Were they aggressive or conservative? What sort of bets did they make? But we rarely think about whether they just got good cards to start with. We don't often ponder if the right cards just happened to come up for them on the turn and the river. *Photo is from waldo843 at Flickr Creative Commons. Thanks, Angela! It's such a good read. It's also given me a framework for evaluating decisions: for trying to understand when my decision making might have been good even when I got a bad outcome. Or the reverse, too: when I just got lucky despite making some boneheaded decisions. But mostly I like the empathy it's given me, through recognizing that people's bad situations are going to have some elements of just being really unlucky in there, along with some elements of decision making. I love the metaphor of poker as life -- especially everyone starting with a different hand! I may have to check that one out of the library. I enjoyed this book too. It was a good read. Life is a lot more like poker than chess. Luck and the starting hand are huge. Even if you make all the right choices, you might not be right. That's just life. That's the truth, Joe. So much luck is involved in all our situations, good and bad. That's not to discount the fact that we ought to make the best decisions and put for the best effort we can. But I get tired of the very successful people in our personal finance world talking about how they got just what they deserved: that others who aren't doing as well are also getting what they deserve, too. It's way more nuanced than that. What's the harm in acknowledging luck's role? All right, I really liked this. Thinking about luck/skill in terms of poker as opposed to something like chess is good. However, my favorite part of this post is acknowledging the bias with which your decisions feedback to you based on the result. This drives me crazy when people see the result as an ever-expected outcome of the decision. I like to think that I make calculated decisions. Because of this, I'm generally ok with the result, even when it doesn't work out in my favor. That's because I knew there was a chance it wouldn't from the outset. Thanks for the kind words, Debt Ascent. I think you have a pretty nuanced and very cool way of evaluating risk, given the way you've described your take on outcomes. I'm still working on getting to that point. I used to play a lot of Texas Hold'em during the high popularity of the game in the mid 2000s. Our friends used to go to each other houses to play until the middle of night. Fun times!! 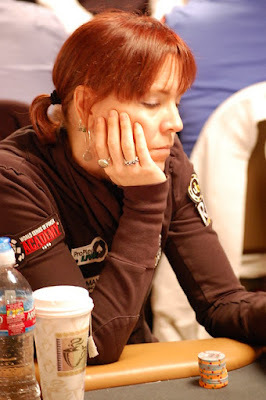 Along with Annie Duke, I really like watching Phil Ivey, Helmuth, and Chris Moneymaker during those tournaments. Sounds like you and I were playing a lot of poker around the same time. We'll still have a poker night now and again but it's rare...usually these days I'm busting out a boardgame instead. Ivey was another one of my favorites. So calm. Definitely give the book a read. It's a good one. Great article. It really got me thinking. I guess the best approach to life and finances is to learn the skills so that we can make the best play of the cards we're dealt and what shows up in the river. Yep! That's a good takeaway. I also like the one Duke mentions about having more empathy for those around us: for realizing the role that luck played in their outcomes. And from a policy perspective, we should maybe try to even out the cards people get.